ww2dbaseWilhelm Bodewin Johann Gustav Keitel was born in Helmscherode near Hanover, Germany to middle-class land owner Carl Keitel. He went to school in Göttingen. In 1901, against all his family stood for, and against his own dreams of becoming a simple farmer, he joined the military. This was how many German middle-class joined the military; if one could not become a farmer for whatever reason, he joined the military, as there was little other careers to choose from. Although not disgraced whatsoever by Keitel's entry into the German military, his father did forbid him from entering the house while wearing Prussian uniforms because of ill feelings from the past. Keitel was a WW1 veteran having served on the western front with the 46th Artillery Regiment. In 1915, he became a member of the General Staff after recovering from injuries received during battle. After WW1, he remained in the German military while maintained some connections to the para-military Freikorps organizations. Between 1924 and the rise of the Nazi Party in 1933, he served in the Reich Defense Ministry; he continued to be valued by the new Nazi government. In 1934, Keitel once again felt the calling for him to become a farmer, this time prompted by the death of his father, who left him the family farm in Helmscherode. He submitted his request for retirement, but instead was offered command of 22nd Infantry Division in Bremen, a bit closer to home than his current post, instead. ww2dbaseKeitel was known to be a man of integrity. One such incidence that illustrated this involved his assigned staff car between 1934 and 1935 in Bremen. It was said that he would only use the staff car when on official business, and no one else, not even his own wife, could ride in the automobile because it was government property even if they were attending a government-sponsored dinner where spouses were also invited. During the war, when gasoline was in high demand, Keitel also contributed his part by giving up his staff car and drove around in a small Volkswagen instead. That was something some of his fellow officers never did; many SS officers continued to be driven around in their full-size limousines. 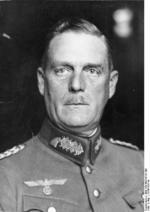 ww2dbaseIn 1935, Keitel was promoted to be chief of the new Armed Forces Office. In 1937, he was promoted to the rank of general and in the following year became the Chief of the Supreme Command of the Armed Forces. In 1940, he was given the rank of Field Marshal by Adolf Hitler, but he initially protested the promotion, citing that all Field Marshals received their titles for valor on the battlefield, not mere administrative excellence. As one of Hitler's top advisors he was known to be on the conservative side, recommending against the invasion of France and later against the invasion of Russia, but was overruled both times by Hitler. He had submitted letters of resignation after each incident, but both times rejected. Despite the resignations, he took pride in his total loyalty to Hitler. Although he and Hitler sometimes disagreed with each other (Keitel went as far as suggesting Hitler was a most stubborn leader), Keitel said that "at the bottom of my heart I was a loyal shield-bearer for Adolf Hitler; my political conviction would have been National Socialist." In the winter of 1942 to 1943 Colonel General Friedrich Paulus' Sixth Army was trapped in the Russian city of Stalingrad without adequate winter supplies; Hitler gave the order "not a step back", refusing to give up an inch of territory gained by the initial successes of Operation Barbarossa. Keitel agreed with Hitler's order, noting that a withdraw only by a few miles would result in a near complete loss of all heavy equipment, and without the heavy weapons the troops withdrawn would be vulnerable to the Russian counterattack that would doubtlessly take place immediately afterwards. b) no information may be given out as to their whereabouts or their fate." ww2dbaseIn captivity, he claimed to have considered suicide but decided that it was not an honorable way to die. "Suicide: how often I have found myself seriously confronted with this as a possible way out, only to reject it because - as suicides have always demonstrated - nothing is changed and nothing bettered by such action. Quite the contrary, the armed forces, whose counselor and mediator I had so often been, would have labeled me a deserter and branded me a coward." ww2dbaseKeitel stood up to his trial with courage, admitting his guilt when he believed the charges were just. For the charge of the inhumane employment of forced laborers, he confessed that it was "the worst" of all atrocities he had committed or during the war. At the very end of the trial he made a plea: he wished to be executed by a firing squad and die a soldier's death. "Even if I failed to recognize the proper limits that ought to have been set upon this soldierly virtue, at least I do not feel I have therefore forfeited my right to atone for this error by the mode of execution that is the right of the soldier in every other army in the world upon whom sentence of death is pronounced as a soldier", he argued. The Allied Control Council for Germany rejected Keitel's request. Along with Alfred Jodl, Keitel was executed by hanging in Oct 1946.
ww2dbaseAfter Keitel's death, Nelte published his memoirs on his experience defending Keitel. Nelte noted that his defense of his client centered around Keitel's loyalty as a professional soldier and patriotism as a German, none of which should be a strange concept for a soldier of any nation, even the victorious Allies who placed Keitel on trial. In other words, it was a defense to save Keitel's face, and not necessarily his neck. Walter Görlitz noted that Keitel was the perfect model of a soldier, obedient through the chain of command and always gave his all when tasked with any responsibility. After all, Görlitz said, with all the dark and shady intrigues taking place at the top echelons of German leadership, Keitel emerged as one of the very few whose position was never challenged by anyone. ww2dbaseSources: the Arms of Krupp, In the Service of the Reich, Wikipedia. 22 Sep 1882 Wilhelm Keitel was born. 14 Oct 1901 Wilhelm Keitel was promoted to the rank of Fähnrich. 18 Aug 1902 Wilhelm Keitel was promoted to the rank of Leutnant. 18 Aug 1910 Wilhelm Keitel was promoted to the rank of Oberleutnant. 8 Aug 1914 Wilhelm Keitel was promoted to the rank of Hauptmann. 1 Jun 1923 Wilhelm Keitel was promoted to the rank of Major. 1 Feb 1929 Wilhelm Keitel was promoted to the rank of Oberstleutnant. 1 Oct 1931 Wilhelm Keitel was promoted to the rank of Oberst. 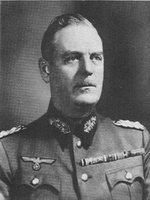 1 Apr 1934 Wilhelm Keitel was promoted to the rank of Generalmajor. 1 Jan 1936 Wilhelm Keitel was promoted to the rank of Generalleutnant. 1 Aug 1937 Wilhelm Keitel was promoted to the rank of General der Artillerie. 4 Feb 1938 In Germany the Oberkommando der Wehrmacht (OKW), Supreme command of the Armed Forces, was created with Wilhelm Keitel as its chief. 1 Nov 1938 Wilhelm Keitel was promoted to the rank of Generaloberst. 8 Apr 1940 German Field Marshal Keitel ordered the transfer of active military servicemen who were 50% Jewish and those who were married to women who were 50% Jewish to reserve or militia units. 16 Aug 1940 Wilhelm Keitel issued the order that, per Adolf Hitler's decision, the landing area in the invasion plan for Britain was to be slightly narrowed as a compromise between the Army (which wanted a wide front) and the Navy (which lacked the warships to secure too many landing sites). 27 Aug 1940 Wilhelm Keitel revealed an invasion plan for Britain that featured four separate main landing sites. 14 Jul 1941 Wilhelm Keitel appeared on the cover of the American news publication Time Magazine. 27 Jul 1941 Wilhelm Keitel ordered all copies of the 13 May 1941 order, which effectively allowed German military personnel to murder Soviet civilians, destroyed. Several copies would remain, however, and surface during the Nuremberg Trials. 1 Oct 1941 Wilhelm Keitel ordered that, in regards to the hostages the German military had been holding and executing in retaliation of partisan attacks, choice of victims would be important, as well-known victims would have greater effect in keeping the occupied peoples in line. 12 Dec 1941 Wilhelm Keitel clarified Adolf Hitler's Nacht und Nebel decree to the leaders of the German military. 20 Jul 1942 Wilhelm Keitel entertained with the idea of branding Soviet prisoners of war/slave laborers on the buttocks similar to how one would treat cattle. 16 May 1944 Field Marshal Wilhelm Keitel issued Adolf Hitler's directive for Operation Kirshkern ("Cherry Stone") to commence the bombardment of England, United Kingdom by long-range weapons. 2 Sep 1944 German Generalfeldmarschall Wilhelm Keitel, head of Oberkommando der Heeres (OKH), ordered that "Malingerers and cowardly shirkers, including officers" should be executed immediately. 12 Feb 1945 Wilhelm Keitel ordered all deserters to be shot. 22 Apr 1945 Wilhelm Keitel and Alfred Jodl departed Berlin, Germany for southern Germany on Adolf Hitler's orders. 5 Oct 1945 Thomas Dodd interrogated Wilhelm Keitel for several hours in the afternoon in Nürnberg, Germany, and the session was observed by Soviet representatives. During this session, Keitel showed scorn for the Soviets, admitted issuing the order to execute captured Soviet commissars, and discussed the torture of Soviet prisoners of war. 16 Oct 1946 Wilhelm Keitel passed away. I don't really understand his life. What was his role in the Nazi Party? On 9 May 1945 Keitel did not sign Nazi Germany's surrender to Russia. On 8 May 1945 the Chief of the OKW and the Commanders-in-Chief of the Army, the Navy and the Air Forces and the Allies RATIFIED hte Act of Miltary Surrender at Reims on 7 May 1945. Germany could not surrender. Only the German Armed Forces. In a strict technical sense, you are correct. Neither Keitel in Berlin nor Jodl in Rheims signed documents of surrender of Germany, as a country, but only the surrender of German armed forces. The instrument of defeat of Germany, as country, was not signed until 5 Jun 1945 with what was called 'The Berlin Declaration' that, interestingly, was not signed by any German official. This declaration asserted (backed up decades later by European courts) that the German state was so utterly defeated through military means that it ceased to exist, except as it was administered 'in condominium' by the Allies.